One day, a fox was walking through the forest. On his way, he found bunch of grapes hanging from a branch of a tall tree. His mouth started watering. He had never had grapes for a very long time. The fox jumped a little to catch hold of a bunch of grapes. 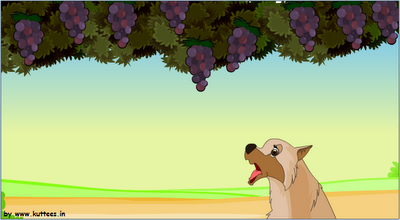 Since the grapes were hanging from a tall branch, the fox couldn't catch hold of it. He tried again to catch a bunch, but again he couldn't do that. He tried few more times, but every time he didn't succeed. Finally, the fox gave up his attempts and he thought to himself, "These grapes should be very sour". MORAL : Many people despise at what they cannot have.